Do you ever just feel like your life will be going along normally, then suddenly 3 million things will start happening at once? That’s how I’m feeling right now (read: super overwhelmed). Right now, I’m trying to make sense of my cookbook offer, figure out my classes for the upcoming semester for my Master’s in Nutrition, and deal with the 10,000 doctor’s appointments that all seemed to fall on this week (well maybe not 10,000, but you get my meaning). Today I have another doctor’s appointment – this time with a GI specialist who I’ve been waiting to see for a few months now. She’s apparently one of the best GI doctors in the area, and I’m really hoping she can help me figure out this awful stomach stuff I’ve been going through. I’m trying not to get frustrated with my limitations right now, but my health problems are REALLY getting old. None of my other doctors have been able to really find a solution to the constant nausea / stomachaches… they’ve all just kind of dismissed it as IBS (which is really hard to treat). But there HAS to be something else going on with my stomach, because this is way out of the realm of normalcy, even for IBS patients. I’m putting a lot of hope in the doctor that I’m seeing today. It’s all I can do. But I should take this opportunity to express gratitude that I actually have access to legitimate healthcare, something that is a privilege in America. I don’t mean to make a political statement, but I don’t know what I’d do if I didn’t have access to the doctors and healthcare professionals who have been helping me. If any of you readers out there work in healthcare, I want to take this opportunity to thank you for making a difference in your patients’ lives. For someone who’s been plagued with debilitating GI symptoms for months now, the healthcare professionals I’ve worked with are a source of hope for me – and I know you’re a source of hope for many others, too. Today’s recipe was inspired by a craving – I just had to have something barbecue-y. It’s something about the warmer temperatures that just makes me crave barbecue flavors. I cooked chickpeas in spices and BBQ sauce, which turned them into something (dare I say) meaty, saucy, and mouthwatering. 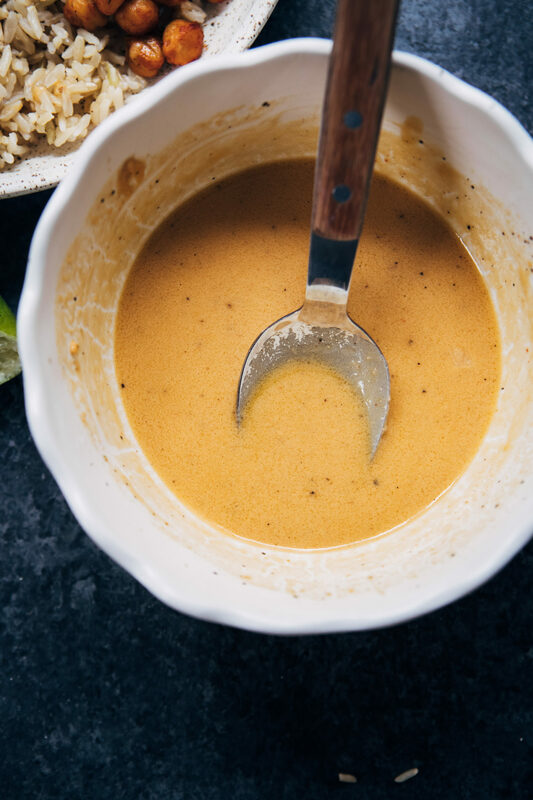 Paired with wholesome brown rice and leafy greens, and topped with an amazing hummus vinaigrette (that you can make with any hummus you have on hand!) – this bowl is a serious winner. 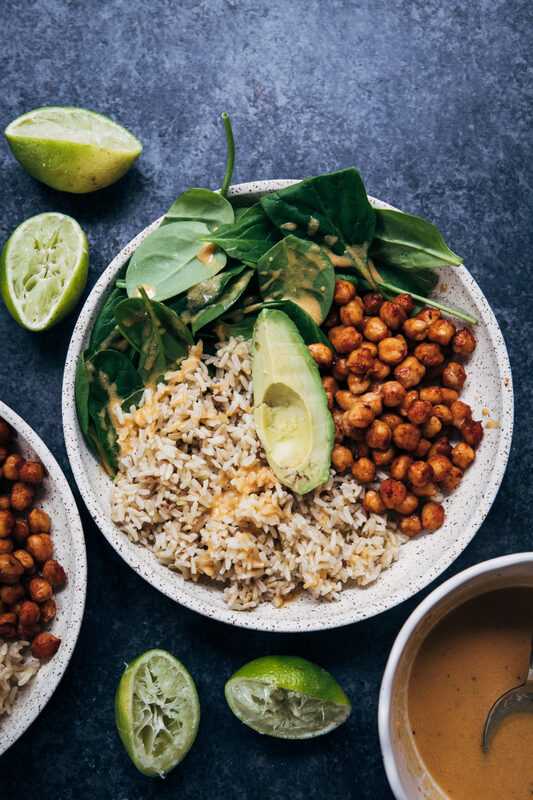 This vegan rice bowl is made with mouthwatering barbecue chickpeas, and paired with long-grain brown rice and a hummus vinaigrette. Start by cooking the brown rice. Bring the rice and water to a boil together, then reduce to a simmer for about a half hour, or until all rice is absorbed. Note - different types of rice can cook at different rates, so when in doubt, just cook the rice based on the package's instructions. When done, fluff with a fork an set aside. While the rice is cooking, make the chickpeas. Preheat oven to 425 degrees F.
In a bowl, combine chickpeas, olive oil, barbecue sauce (just use your favorite kind), and spices, and mix until the chickpeas are evenly coated. Line a baking sheet with parchment paper, and spread chickpeas out as evenly as possible. Bake chickpeas in the oven for 20 minutes, stirring halfway. When done, remove from oven and set aside. In a blender, combine hummus (any kind will do - I used chipotle hummus), olive oil, and lime juice. Add in the juice from 1 lime, taste, and add juice from another 1/2 lime if you like. Blend until everything is evenly mixed. Taste and adjust seasoning if necessary - add salt or pepper, etc. In bowls, portion out rice, chickpeas, baby kale / greens, and any other toppings you like. Top with as much hummus vinaigrette as you like, then serve! I just started getting into chickpeas, no I can’t stop! BBQ chickpeas sounds incredible, especially as a topping to this wonderful rice bowl! BBQ chickpeas are the best!! ;) Thanks girl! You have a new partner now. I am a fan of BBQ chickpeas as well. Yum !!! I’m so sorry about your stomach issues…it’s so frustrating when no one has any answers. Trust me, I’ve been there. Best of luck with the new one. Where are you studying for your Masters of Nutrition? I’ve been looking at programs and am overwhelmed! How did you make your decision? This sounds yummy. I would switch the brown rice and use quinoa but it’s all good! This looks super tasty, Sarah! When it first popped up in my Feedly, I assumed you’d just mixed the chickpeas with the BBQ sauce – but roasting the sauce covered chickpeas is brilliant. I bet that really ups the flavor factor! I get it, Sarah! I struggled with an undiagnosed dairy allergy for years, and my boyfriend has serious stomach issues that still haven’t been diagnosed after multiple invasive tests. It’s so hard. Someone will be able to figure it out, though, eventually. I hope this appointment goes well and you’re feeling better soon. Sending light your way this week! 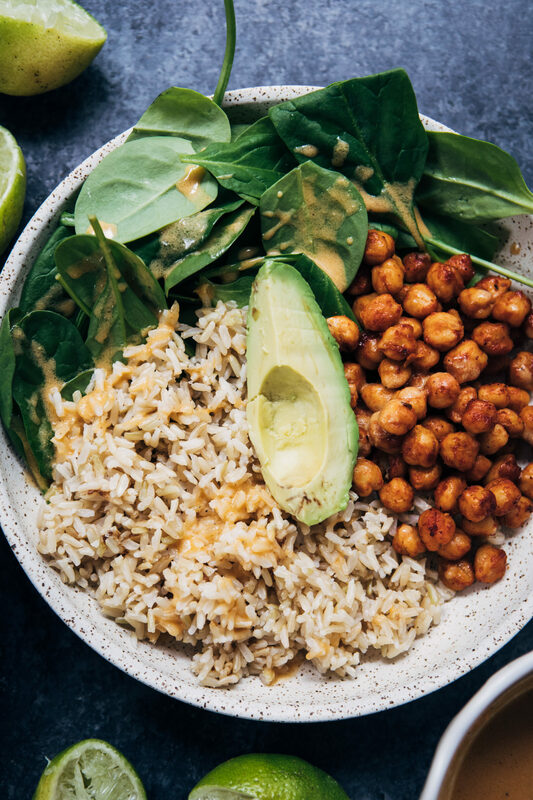 This bbq chickpea rice bowl looks so good! The first time I had hummus as a sauce/vinaigrette was actually at my mother’s house when she made us a vegan bbq platter. It was so good and before I’ve never thought of the idea to make hummus more liquidy. My mum is the farthest away of becoming vegan, but since I’m only visiting a few times a year, she always wants to impress us with delicious vegan food for me and my boyfriend. So sorry to hear about your stomach thing! I can totally relate in a way. I’ve been having stomach troubles for almost 8 years now! It’s not permanent however and it appears to only happen when I’m under a lot of stress (I easily get stressed) and I guess it’s more like a psychological issue because I’ve pretty much ruled out all food in tolerances. I hope you’ll get to the source of your stomach thing soon. <3 Much love and take care! This is my idea of comfort food, Sarah! It’s beautiful, nourishing, flavorful, filling…couldn’t ask for more in a recipe. I certainly know the feeling of overwhelmed (it’s pretty much how I’ve felt throughout the last year! ), but I think it’s great that you can still exercise gratitude and perspective amidst all of the stuff that life is handing you right now. Good luck riding it out! Expressing gratitude is how I try to prevent being overwhelmed by being overwhelmed ;) Thanks Gena!! I’m still a little iffy about jackfruit too… I would have no idea how to break it down either!! ;) But thank you so much for your kind words of encouragement, Traci, I hope I’ll find resolutions to my issues soon.